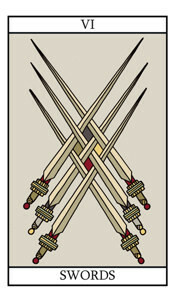 The Six of Swords is a card that symbolizes balance and harmony after a period of turmoil. It Is symbolic of the restoration of equilibrium to a situation. It is a slow but sure, steady progress after a period of turbulence. It is an indication that difficulties and challenges have been overcome and anxieties quashed. However there is more to this card, because as well as indicating progression away from difficulties it is also symbolic of answers to puzzles. If you have a brain teaser to solve or a Mathematical problem that is posing a problem, then this card indicates that the answer may just lie round the corner. With this card in your spread the attributes of peace, equilibrium, harmony and the solutions to problems are well starred. The Six of Swords Card illustration.